Mrs. Idestrom wanted us to create a website for her where she was able to post all things related to the courses she teaches, including the course outline, handouts, Powerpoints as well as due dates for assignments. In the beginning, there were many different options on which website we should host her site on, such as Wikispaces and Webs, but in the end we decided to use Google Sites. We chose to use Google Sites because Mrs. Idestrom already had a Google account, so it was one less step for her to do. Also, because she already had an account with Google, she already had the default built in services to use such as Google calendar, which was beneficial for her since one of the main goals was to have a calendar on her site. At the end of this project, Mrs. Idestrom also wanted a handout with basic instructions on how to use Google sites so she can keep her website up-to-date. For our portfolio, we used Camtasia Studio to create a video that gave a brief tour of Mrs. Idestrom's website. Google Sites can be used in many courses. 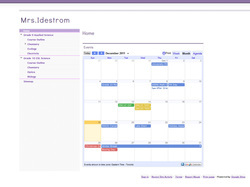 However, because this specific site was designed for Mrs. Idestrom's courses, it will not be useful in other courses. However, Google Sites itself is useful in any course, whether it is science (as seen here) or English.